Despite our daily communication with friends, family, and coworkers, reconstructing a natural conversation is surprisingly hard. Countless films struggle with believable dialogue, earning praise when successful. Actors are paid to communicate naturally, avoiding awkward silences or strange intonations that seem out-of-place for a particular scene. Many videogames have no voice actors to worry about and still have trouble incorporating players into an engrossing dialogue. One potential pitfall, as I have mentioned before, is that most of the time we don't really have anything interesting to say. In order to maintain an exciting pace and indulge the protagonist's self-importance, even nobody non-player characters may respond with overly dramatic dialogue and emphatic intonation that seems out-of-place. Dialogue becomes even more treacherous when player choice is involved. 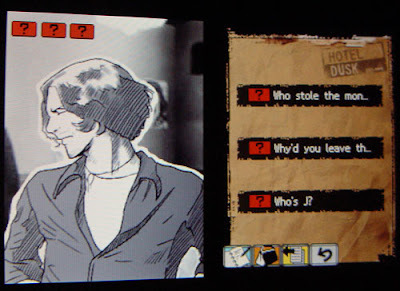 Traditionally, players participate in conversations through dialogue trees. Branching choices shape the outcome of a conversation, alternatively offending or befriending NPCs with a few available responses. Bravo for developers who wish to maintain interaction throughout the entire experience, but in-game conversations via dialogue trees are strange. Real conversations, particularly with strangers, tend to be much less rewarding. Rarely do these consist of one or two sentence inquiries with an equally short response. Intimate chats with friends and family is not unusual. These conversations can last quite a long while, covering a range of topics and including long rants. A good game of D&D can include such ramblings because the game creator is there to make up things on the fly, but videogames are sadly incapable of such spontaneity without exquisite AI. In the mean time, our own dialogue takes the form of text-based responses. been?" with an accusatory tone. Hotel Dusk has no voice acting and suffers from this problem far too often. The detrimental solution is to create extreme dialogue that is difficult to misinterpret but obviously overblown. 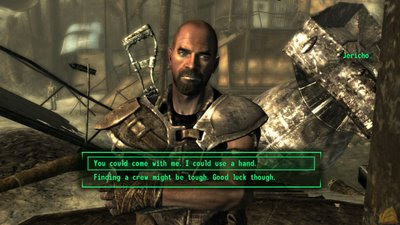 Dialogue choices in Fallout 3 are clear cut, even extreme, seeming very unrealistic. Developing a morally gray character is difficult in these circumstances. When I threaten to kill someone, I have no doubt they'll understand my meaning. Such threats cannot be insinuated; thus, a great deal of narrative depth cannot be created without veering from the standard dialogue construction. Also, Fallout's protagonist repeats your text choice verbatim, without their own accompanying voice. In order to simplify player choices, the game unrealistically constrains dialogue. 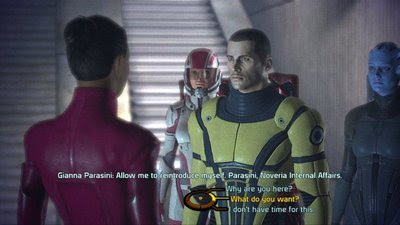 Mass Effect and Hotel Dusk adapt and improve conversations by giving players only the general idea of dialogue choice, and then allowing the protagonist to respond appropriately. In this way, player choices are simplified while still allowing subtle intonation in their response or through voice acting. The problem with Mass Effect's dialogue is that player choices are not always reflected in the conversation. Perhaps the way I interpret certain dialogue contrasts with the game designers interpretation. This can be troublesome. For example, if you choose a dialogue option with an exclamation point and the character does not yell their response, are you unsatisfied? Of course, these are my personal preferences. I can understand some players wish to know exactly what their character is going to say before they say it. But to satisfy my own desires, dialogue options should have as much information regarding its tone as necessary to convey meaning, including descriptive tags (such as hostile, inquisitive, insulting). Alternatively, voice work can accompany text choices to convey meaning through intonation. Including realistic NPC relationships, there is still quite a bit of innovation to be made in RPG dialogue. We could always relegate all conversations to cut scenes, but we would be missing unique opportunities for interaction in moments with undoubtedly long lasting effects. Some great and terrible repercussions can stem from simple conversations. Alternatively, we can go the Zelda route and just not say a thing. Sometimes, shutting up can be awfully appealing. "What's going on and who are you?" And speaking of Emily Short, please please try out her quick-but-wide IF game Galatea. The entire thing is one big sophisticated attempt at conveying the nuances of a conversation, where you are simultaneously trying to find out about what you're interested in and to influence the person you're talking to through your questions. It works so well that I'm surprised not to see lots of indie & commercial games mimicking it. I must say I found that aspect of Mass Effect to be the most frustrating, especially when I had specific emotional motivations to choose the dialogue for my character. I guess my question is this: Do you see an effective emotional mechanic as a possibility within games? I mean, we have definitely seen an introduction of a modicum of morality and the game's outcome based on said moral choices (I'm looking at you Fable, but also others). Additionally, I love you guys. Not only did I successfully divert myself for catching up on your old blogs I missed, but I found new love in a bunch of new blogs. Thanks! The Mass Effect fake dialogue outcome irked also. If my choice is meaningless, I'd prefer not to be given the choice at all. It is belittling otherwise. Which I suppose is an arguement in itself. I don't always need to interact with dialogue choices, particularly if my character is having a heated conversation. Heavy Rain looks like it'll add some interesting mechanics to conversations and internal dialogue. Thanks for the heads up. I tried it out and enjoyed it, particularly the way it drops ideas about what you might want to ask next, but doesn't require that response. I think people are scared of including interactive conversations in their games because communication is so damn complicated in real life also. Thanks for your company and compliment, we aim to please. Also, I absolutely think effective emotional mechanics are possible. Cut scenes and plot elements aside, I think dialogue is a great way to evoke emotion. Some of the most emotional scenes in film take place during rants or conversations. To mention Heavy Rain again, and judging from Indigo Prophecy, I think Quantic Dream may be a studio to look at for such innovation. Mass Effect has the best conversation system I've seen yet in a mainstream game - I was also working my way through Shivering Isles at the time and the huge difference between having a proper conversation and just picking one or two crude options from a tiny menu is huge. I'd go so far as to say that every game I've played since Mass Effect has seemed restrictive in its character interaction options. I don't really see the issue with the 'fake' options given how detailed and well-written most of the conversations are. Sure, Shepard might not say exactly what I wanted her to say, but her comments were always in the right spirit and reflected what I wanted to say (and sometime put it better than anything I would've come up with in the heat of the moment). Interesting conversation folks. I guess I'll have to add Mass Effect to my "never played" pile of shame. I haven't read the Emily Short pieces yet, but they look enlightening. I once heard someone propose an idea for dialogue trees (possibly on the Idle Thumbs podcast) in which the conversation would take place in a quasi-real-time active mode, reminiscent to Fallout 3's VATS system. Whenever a dialogue juncture would arrive, the game would slow down and present a slew of options that the player would then "target." The player would have a limited time to target them, so as to simulate the flow of a natural conversation. Additionally, the system would not allow the player to simply start the conversation again to cycle through all the dialogue options to "brute force" their way to the answer they want to hear. A system like this would make conversations more active, more in line with how conversations go in real life. Basically it would be turning a "dialogue tree" into a "dialogue bush," one with a multitude of offshoots and paths that would both draw the player in actively and present meaningful choices with lasting effects.